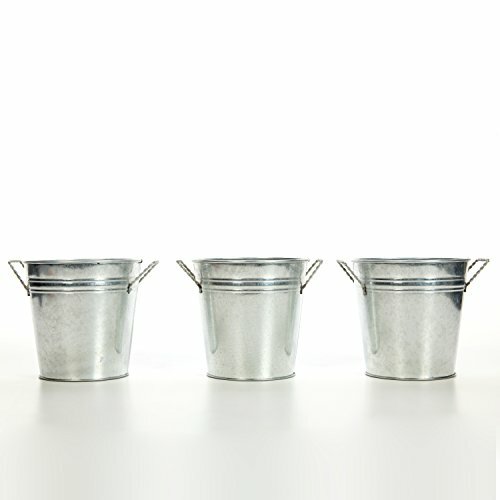 Hosley's 3 pack of Galvanized Planters. Each planter measures 5" x 5" x 4.5". Must use watertight liners if used with fresh flowers. For decorative use only. USES: It is just the right use for dry floral or greenery arrangements, as a decor next to fireplaces and as a planter, for both fresh flowers or plants (must use protective liner if used). It can be the right gift for wedding or special occasions. BENEFITS: It can accent your home or office for the right decor with or without floral or greenery additions. Must use liner if used with fresh flowers. MEASUREMENTS/MATERIAL: Each one measures 5" x 5" x 4.5", are a set of 3 and metal.